SCVHistory.com TLP1401 | Tataviam Culture | Marriage License & Cert. : Margaret S. Rivera (Garcia) & Eldridge A. Ward, 1914. Marriage license (top) and marriage certificate for Margaret Sylvia Rivera (Garcia) of Castaic (Sept. 12, 1899 - Oct. 30, 1975) and Eldridge A. Ward of Castaic (originally Nebraska), age 33. The couple was joined in matrimony in Los Angeles on July 13, 1914, by J.W. Summerfield, a justice of the peace. The union established the Ward line of Native Americans. This was the first marriage for Margaret and the second for Eldridge, whose parents, A.A. Ward and Belle Tyler (Ward), were born in New York. Witness to the ceremony was Francis Olme. More on her in a moment. 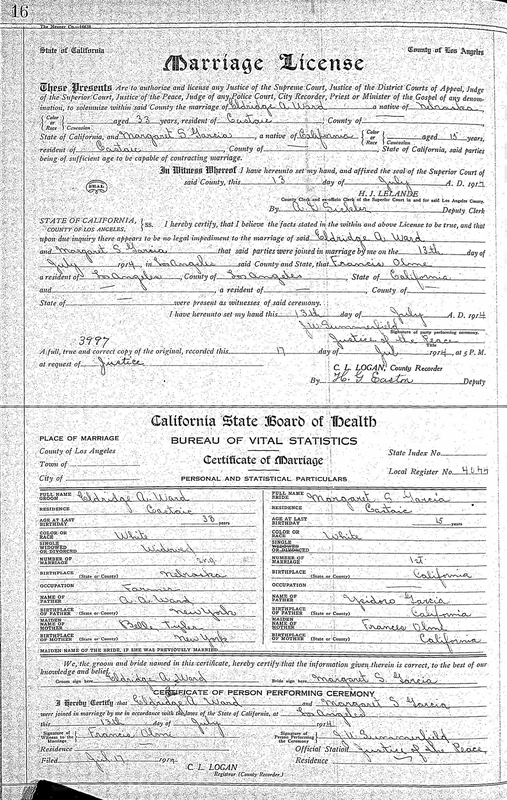 Margaret's parents, as indicated in Margaret's death certificate, were Petra Garcia (Rivera) and Joseph Pedro "Pete" Rivera. On her mother's side, Margaret's ancestry traces to individuals who lived in the Tataviam Indian village of Chaguayabit (Tsawayung) at Castaic Junction prior to European contact in 1769. Margaret's father, born at Elizabeth Lake, is said to descend from Tejon Indians, an appellation for Native Americans of various cultures, including Tataviam, who were taken to the San Sebastian (Tejon) Indian Reservation in the 1850s-1860s. This marriage license identifies Margaret's parents as Ysidoro Garcia and Francis Olme. They were not her biological parents; rather, they raised her. Petra Garcia Rivera being a teenager when Margaret was born, Margaret was sent to live with her maternal grandfather, Chief Ysidoro Garcia. Ysidoro lived in the household of another of his daughters, Chief Frances Garcia Cooke, and her husband Fred S. Cooke. Francis Olme lived with them, too, and helped raise Margaret. Francis was Fred Cooke's mother. (Her husband, Fred's father, was murdered in 1890.) As for Francis being listed as the parent and the witness to the marriage ceremony, it would have been necessary for a parent to give written consent for the marriage. That person was probably Francis. Maybe that's why they traveled to Los Angeles to marry. The local justice of the peace in Newhall, John F. Powell, would have known otherwise. TLP1401: 19200 dpi jpeg courtesy of Tricia Lemon Putnam.